Dragonflies have such delightful common names. 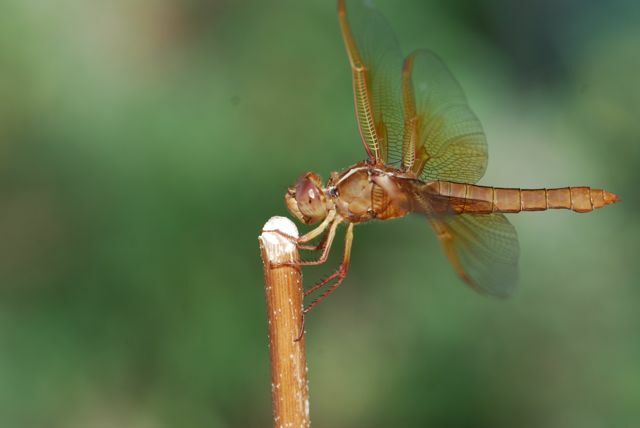 If you have ever seen dragonflies flying over a pond, you know why many have the common name "skimmer." Take the flame skimmer, so called because the mature males have a orange to red head and abdomen. This newly-emerged male hasn't developed his full coloration yet. 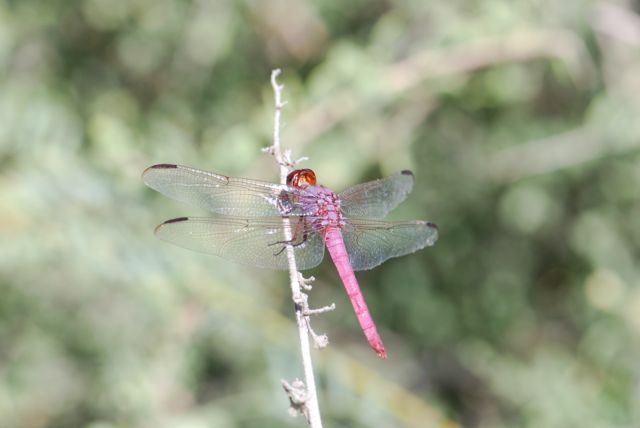 The male roseate skimmer has a magenta or purplish hue. 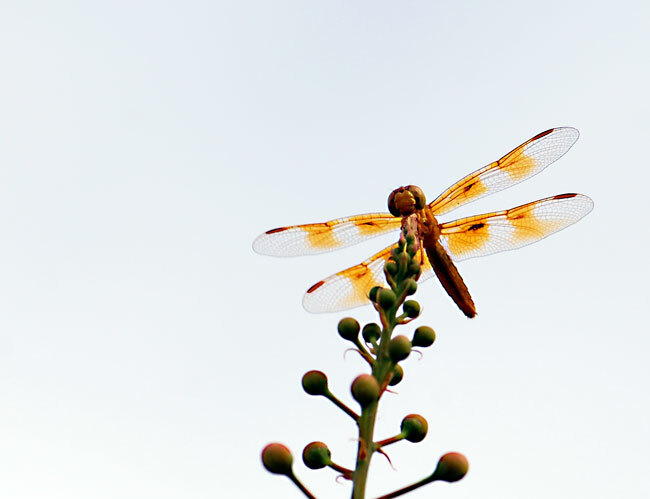 Other dragonflies named for their colors include the Mexican amberwings, which are smaller than flame skimmers. 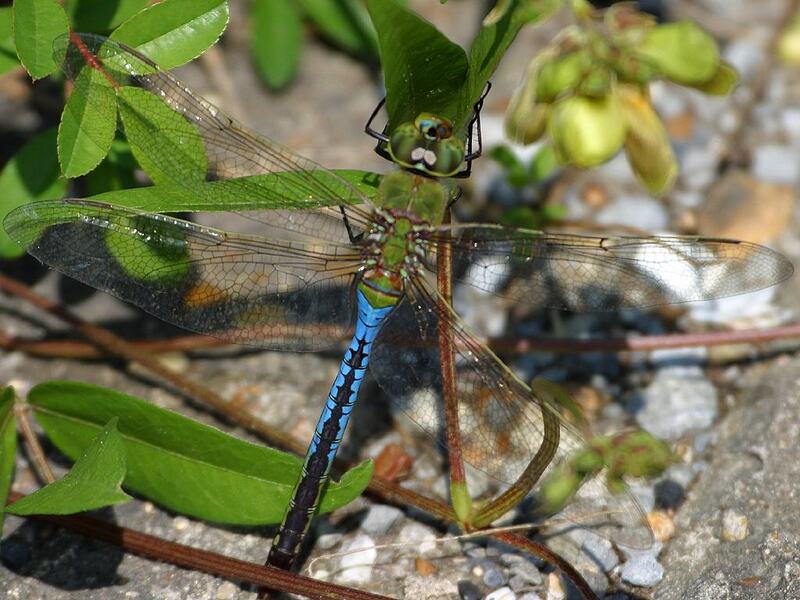 The name darner seems appropriate, given their long, slender body. Take this common and widespread species, the green darner. How about the black-winged dragonlet at the Arizona Dragonflies website? What is the name of your favorite dragonfly? Disclosure: I am an affiliate with Amazon so I can provide you with cover images and links to more information about books and products. As you probably are aware, if you click through the highlighted title link or cover image and purchase a product, I will receive a very small commission at no extra cost to you. Any proceeds help defray the costs of hosting and maintaining this website. Two years ago I caught a Mexican Amberwing dragonfly hovering over the water. I have wanted to get a photograph of one sitting still ever since. I finally had a chance. It was perching at the top of a red bird of paradise. It is a pretty small dragonfly, although there isn't much here to give it scale. Dragonflies are interesting because they vary a lot in color. Some amberwings have completely brown-gold wings whereas others have patches in clear wings like this one. Makes dragonfly identification quite tricky at times. 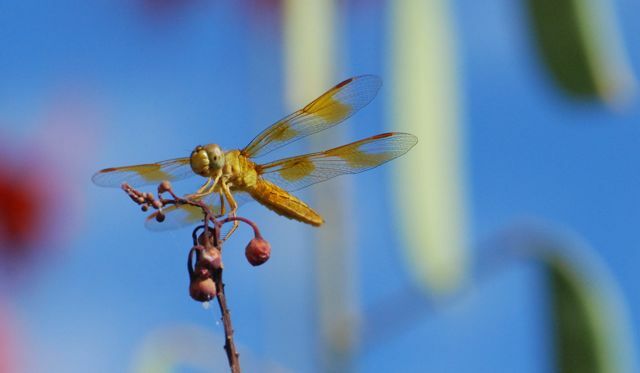 Arizona Dragonflies has a lovely series of photographs of Mexican amberwing dragonflies that show the variation in wing color. It always amazes me to see dragonflies flying miles from water in the desert. It just goes to show how strong fliers they are. This one was perching and then catching flying insects as they flew by. Have you spotted any dragonflies this week? Have you ever wondered how nature photographers capture such wonderful shots of flighty insects? Take damselflies like this one. 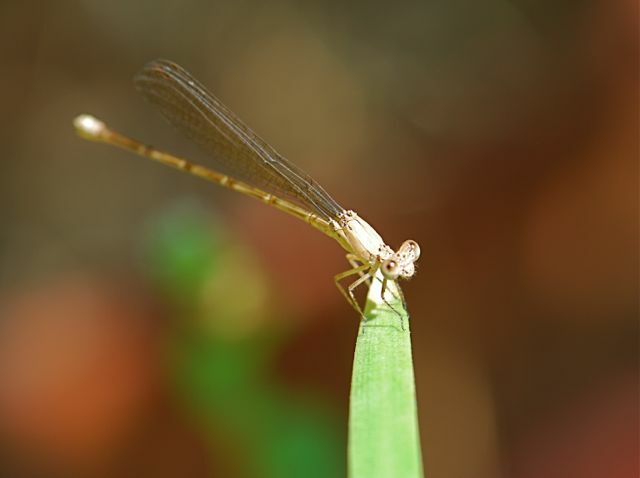 Damselflies, and their relatives the dragonflies, are fast, strong fliers. How do you ever catch one sitting still enough for a photograph? 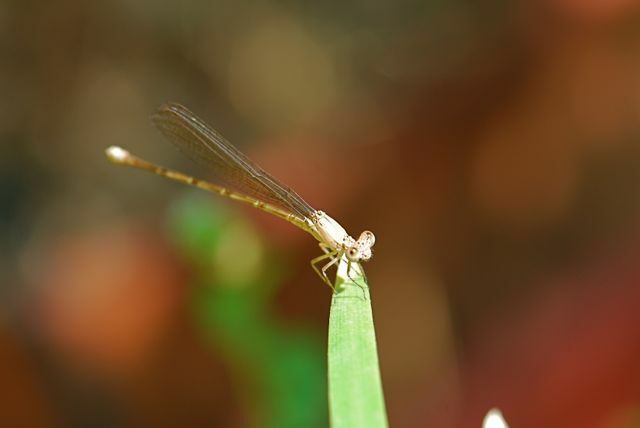 It helps to know the damselfly's behavior. For example, this damselfly was not exactly sitting still, although it looks like it from the photograph. What it is doing is perching, waiting for a fly or some other potential food item to fly by. See those big eyes? When it spots something, it launches into the air and grabs the prey. The beauty is that these insects often return to the same exact perch to hunt again and again. With patience, you can set up your tripod and grab a good shot of an active insect in a moment of stillness.